Have you been getting the feeling that your home is drab and out of date? We can relate – and we’ve also gotten sticker shock when we do research about how expensive refinishing or renovating areas in the home can be. Luckily, there’s another option available that’ll give your home a total makeover, and won’t require expensive labor or materials that’ll break the bank. Picture your living room. What’s the focal point? It’s probably your couch, and even if the couch has seen better days, it was an expensive investment and something you’re probably not looking to replace. Why not give your interior décor a bit of a makeover by reupholstering it? Whether you’re reupholstering your existing couch to give it new life, restore a classic seat you found at a flea market or want to update your mishmash of seating to match your new room, an upholstery project can take any outdated piece of furniture and make it look brand new. Modernize the look of a classic piece of seating or give an era-appropriate look with fresh fabric – and you can do it yourself without spending thousands. SF Gate offers some great DIY tips to help you get started. Choose an exciting, bold and modern pattern or stay on the neutral side, either way sprucing up your couch or chairs will make your living room feel like a whole new space. It’s also a great way to save on an interior redesign. If you decide to redecorate, repaint or change the entire color scheme of your room, you don’t want furniture that stands out in a contrasting or clashing color. Choosing to reupholster your furniture is the perfect – and cost-conscious – solution. Upholstery can also give your car a new look. If your vehicle’s interior has seen better days – spilled coffee, dirt and grime, sun fading, or whatever else – our car upholstery fabrics allow you to re-cover those seats and refresh your car’s interior. This is also a great option for anyone building a custom car or restoring a classic vehicle. Choose from an array of colors and materials at our San Antonio store and find exactly what you’re looking for to make your car look as good inside as it does outside. 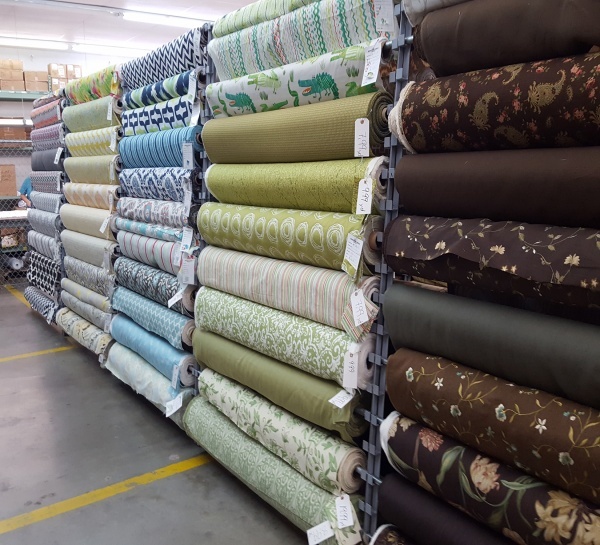 No matter what fabric project you have, you’ll find all the upholstery products you need at Fabrictopia. Stop by our San Antonio location at 926 W. Laurel in the Five Points District and shop our full selection of home and vehicle upholstery fabrics today. Fabrictopia, the premier discount fabric outlet.